We went out for a sail, taking Greg's parents. 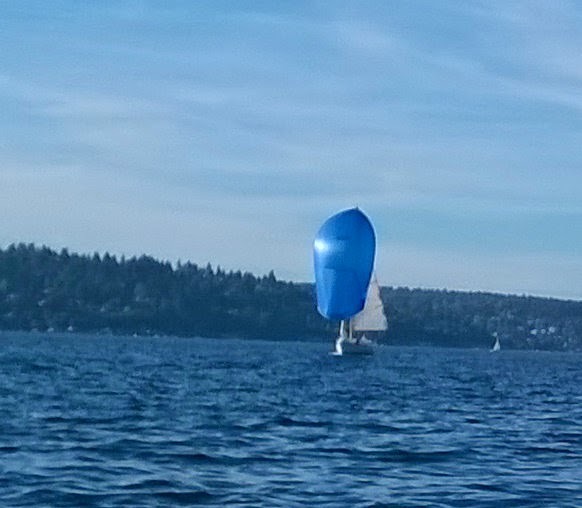 It was a beautiful day, and there were more sailboats on the lake than power boats, many with their spinnakers out. We were briefly entertained when one sailboat lost control of the spinnaker lines as they tried to raise it and they struggled for a while trying to reclaim their spinnaker as it flew about. These beautiful days are going to become more infrequent here soon. The Seattle area is well known for its rainfall, but much of the rest of the country thinks that means frequent thunderstorms and heavy rain. It is not like that at all. Here is a Seattle joke: A guy visits Seattle and stays at a hotel. He comes out of the hotel the first day and it is raining. The second day it is raining. The third day it is raining. He sees a kid on the street and says, "Hey, kid, does it ever stop raining around here?" The kid replies, "How should I know, I'm only five!" Another Seattle joke: We do have a summer in Seattle. Last year it was on a Wednesday. These jokes are something of an exaggeration, of course. 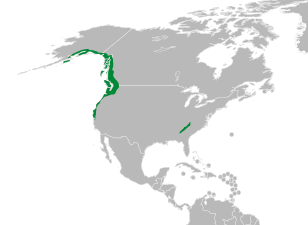 Seattle falls within the Pacific temperate rain forests ecoregion. This rain forest extends from Northern California, all the way to Alaska. In a rain forest, there are really only two seasons, the rainy season and the dry season. In Seattle, the wet season begins some time in September or October and ends about May or June. During the rainy season, we have as many as 19 days a month with measurable rainfall. There are many other days with no rain, but no sun either, being clouded over the whole day. Thunderstorms are infrequent, and even when we get them, they are usually short and unspectacular. During the dry season, there is still measurable rain, but tapers down to only about five days a month. People here complain that Californians come up here for a vacation during the dry season, see how nice it is, and move here. Then it starts raining and they gripe for the entire rainy season. We recently watched a TV series called "The Killing" that is set in Seattle. It is obvious to any Seattlite that the writers and producers are not from here. It is actually filmed in Vancouver, British Columbia, Canada, not Seattle. However, Vancouver has almost exactly the same weather patterns as Seattle, so that does not explain the rain in the show. The first sign of non-Seattle production is they have a guy carrying an umbrella. We just do not do that. Seattle's rain is typically more like the mist machines in the lines at Disney World. It gets you a little damp, but it evaporates almost immediately. The amount in inches is negligible. However, in The Killing, it is obvious that they film using rain machines, because the rain comes down like it does in Florida: heavy. There are exceptions in Seattle where the skies open up, but it is infrequent. In Seattle, you are more likely to wear a lined rain coat than carry an umbrella. You need the lining for warmth. Seattle has an average temperature of 76°F during August, the hottest month of the year. We get little snow, though, because the average temperature during the December through February, the coldest months, is 36°F. The coldest days usually do not have snow because clouds trap in heat, and you need clouds for snow. We get this equilibrium where it might snow, but the clouds hold in enough heat to bring the temperature above freezing, so it just rains. When it does snow, Seattle is frightening. Since it happens infrequently here, drivers do not know how to drive in it. The first thing they do is jam on the brakes and slide into the thing in front of them, rather than pumping the brakes and steering. The city shuts down with 2" of snow, as nobody can get to or from work with the freeways jammed with accidents. At one particular intersection at the bottom of a hill, in one hour during a snow storm, Greg witnessed 17 accidents. In a typical year, we might get one week above 90°F and one week below 32°F. The hot is actually more of a problem than the cold. Everyone has heat, but most houses, including ours, have no air conditioning. When it is above 90°F, it is miserable. We have an air conditioner for the hottest room in the house, but no central air. During the rainy season, we may go days without seeing the sun. This causes problems for some people. They get Seasonal Affected Disorder, which is a kind of depression induced by the lack of sunshine. The lack of sunshine from the clouds is compounded by the fact that we are at about 47° latitude. This causes the sun to set at about 4:10 p.m. on December 5th. On the other hand, it does give us very long days during the summer dry season. You can still hit a tennis ball without lights after 9:30 p.m.
All of this makes for perfect sailing conditions in the dry season, and miserable conditions in the rainy season. We are starting to make plans to pull the boat out some time in the upcoming weeks.